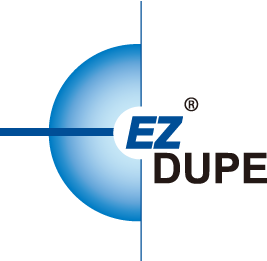 EZ Dupe was founded in 1995 in Los Angeles, California, USA, and aimed to develop the data duplication systems market in North and South America. Within five years, EZ Dupe emerged as the leader in duplication equipment industry, with customers from across the United States, Canada, Mexico, Brazil, Chile, and more. In order to provide customers with products and service of even higher quality and flexibility, EZ Dupe established its research and development (R&D) center and manufactoring facilities in Taiwan, in 2005, and began to venture into markets beyond the Americas. Now, with twenty years of enterprise and experience, EZ Dupe is recognized as the global leader in the duplication equipment industry. EZ Dupe targets to provide the simplest solutions to fulfill customers' most complex needs. To accomplish this goal, EZ Dupe continually invests finance and personnel resources in R&D; currently, more than half of our engineers have over ten years experience in data duplication. EZ Dupe also consistently refines its production process and quality control operations, and strives to elevate its products to the highest level using customer feedback and simulation testing. EZ Dupe products are undoubtedly the best in its category in terms of their performance, durability, and compatibility. Based on advanced technology, EZ Dupe develops various duplicators for different media including CD/DVD/BD, flash memory, hard disc drive....etc. We also have interactive products to copy one kind of media to the other kinds, like USB to DVD, SD to HDD, CF to USB.....and so on. EZ Dupe sales range across over thirty countries in Europe, North and South America, Austratlia, Africa, and Asia. In North America, EZ Dupe owns the largest market share for duplicators, far above its competitors. The EZ Dupe brand is not only widely recognized in many retail channels----- such as Best Buy, Walmart, and Staples ---but also the unique brand which Ingram Micro is willing to carry for resellers. At online retailers like Amazon, B & H, New Egg, and Tiger Direct, EZ Dupe brand is the top choice for many end users. At EZ Dupe, we recognize that every business is unique, so we offer exclusive and customized products to meet the specific needs of various customers. We provide a complete product line, from optical disc (CD/DVD/Blu-ray) duplicators , Flash Media (USB/SD/Micro SD/CF/CFAST) duplicators, and Hard Disk Drive dupicators, to other professional data duplication systems. We have established partnerships with many industry-leading companies to offer the best solutions and most professional services for customers' production challenges. We also provide comprehensive after-service and technical support, so customers can purchase our products with confidence and peace of mind.